(From Fujifilm lens literature) FUJIFILM North America Corporation has announced the new FUJINON XF23mm F1.4 R, a premium wide-angle lens designed to work seamlessly with the award-winning line of X-Series compact system cameras. The new FUJINON XF23mm F1.4 R provides enhanced resolving power with crisp contrast to draw maximum performance out of the highly descriptive X-Trans CMOS sensor. The fast F/1.4 aperture allows the user to reduce blurring in low light conditions and achieve stunning shallow depth of field photography. Lens distortion has been reduced to an absolute minimum using only optical rather than digital correction, thereby delivering the highest possible picture quality. The rounded seven-blade diaphragm ensures smooth bokeh even when shooting portraits or product shots at a medium aperture to maintain reasonable depth-of-field. The FUJINON XF23mmF1.4 R uses an internal focusing system which incorporates a lens group consisting of three cemented lens elements and one aspheric lens element in order to keep weight down. Additionally, the built-in high-torque DC coreless motor delivers ultra-fast AF performance for the most demanding shooting opportunities. The FUJINON XF23mmF1.4 R weighs 10.6oz and measures just 2.48” in length making it the most compact and lightweight lens in its class. Metal parts are used for the focus and aperture rings, which are designed to give just the right amount of torque and feel. 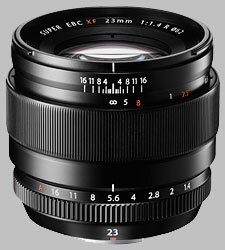 The FUJINON XF23mm F1.4 R will be available in October 2013 for $899.95. Like nearly all Fujinons, this one can match most of it's bigger SLR brothers in nearly every way. It's sharp and optically well corrected. And with 300g it's light too. The clutch AF-MF mechanism works great and focus speed on a X-T1 is good too. The only draw back is, that the lens hood is way too big for this lens. One of the best (if not the best) Fuji X lens.